Do you have a large acreage property? Are you seeking to keep your pup safe while roaming your land without the use of expensive fencing or other unsightly physical barriers? Have you checked into wireless options but aren’t sure where to turn? We have you covered and have taken the guesswork out of choosing the best wireless dog fence for large acreage areas. Why You Might Need A Wireless Dog Fence For Large Acreage? When it comes to keeping your dog safe, you want to always make sure they’re contained to a specific area to avoid wandering off. This is especially important if you live near a busy road or heavily wooded area. Dogs can easily become distracted by a sound or smell and wander off. This can even occur with the best trained dogs out there if the smell is enticing enough. Unfortunately physical fencing can be quite expensive and at times unsightly, especially if you’re in an open area where you don’t want the view obstructed. This leads a lot of owners to a wireless option which provides the safety they need without the high costs and potential disruption. There are tons of pros to wireless dog fencing vs traditional options. Are In-Ground Fences Better Than Wireless Fences For Large Acreage? The pros and cons when comparing each depend on your unique situation. As mentioned, physical fencing can be very expensive for materials and installation when you’re dealing with a large area. It may also not be a viable option if you’re on rocky terrain where posting can be difficult. In addition, these physical boundaries can obstruct views which is a big turn-off for some homeowners. However, in some cases owners may find their dog too large for the warning administered to be effective. Would My Wireless Fence For Large Acreage Work For Multiple Dogs? Yes, some systems do come with the option of adding multiple dogs to the program. You want to make sure you select a system with this option, especially if you’re planning on adding to your pack anytime soon. As with any system, make sure the collars provided are appropriate for the size of dog they’ll be used on. How Do I Install A Wireless Dog Fence Over A Large Area? Not every wireless system is created equal. Some may only cover an area as small as a city backyard. You want to make sure you purchase a system that is large enough for your desired area. When setting up a desired space, make sure your dog has ample room to move about and that the boundaries are easy for them to distinguish. Do not zigzag or make an overly complicated layout. It make training your dog more difficult and can affect your installation as well. You also want to make sure you don’t cross any utility lines for safe digging. The larger the area, the more transmitters you may need. This is also true if you have a complicated layout as mentioned above. These will greatly up your overall costs. Depending on the size, installing a system should take about a day. It involves digging and laying underground wire so be sure to set aside at least a day if you’re dealing with a large area. Training your dog, however, may take up to a week. 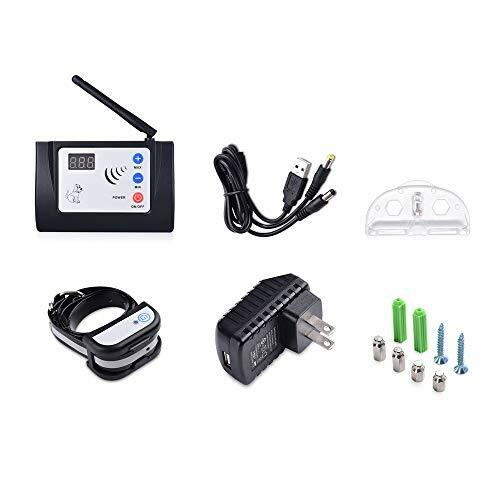 Please watch the video below on how to install a wireless dog fence over large acreage area and how to train your dog for the wireless fence. How To Train Your Dog With A Wireless Fence Over A Large Acreage? When acclimating a dog for the system, it’s important to not simply let them free and risk them shocking themselves by running through the boundary without warning. You want to ease your dog into the designated area with the use of a leash or other method like a remote collar that you may have been using. Walk around the property with your dog well within the limits by several feet. 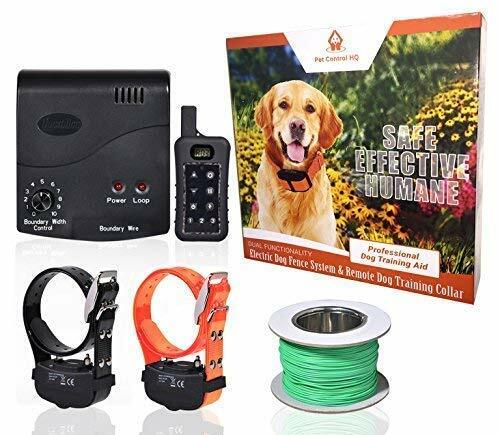 Walk this perimeter several times, correcting the dog either with the remote collar or voice command if they try to get close to the boundary. In essence, you’re setting a safe boundary within the limits to avoid potential shocks. You want to test your dog’s compliance to this imaginary boundary before testing them off-leash by loosening the slack. Anytime they near the boundary, issue a correction. Keep the experience positive but firm. In time, your dog will have this inner boundary established and you can begin testing off-leash. Off-leash, you want to issue verbal commands to your dog if they near your inner boundary. If ignored, utilize the leash again. Repeat as necessary. What To Look For In The Best Wireless Dog Fence For Large Acreage? Coverage can be anywhere from 0.5 acres to 30 acres. Make sure you pick a system designed for your desired coverage area. There are customization in-ground fences that allow you to plot as you with and portable fences that don’t require laying wire. You need to establish which works best for your application. Not all correction levels are appropriate for every dog. A dachshund won’t require as much shock as a German Shepherd. Keep this in mind when selecting a system as well as when setting the collar for your dog. As discussed, there are wireless and traditional wire options on the market. You need to determine which works best for you. Wired options take longer to install and may be difficult in some terrains. These systems aren’t cheap. They’re more affordable than a traditional barrier, but will often still cost over $100. The NeoPaw Wireless Dog Fence Containment System is an affordable option for those looking to contain their dog within a given space. It was very much a no-fuss option for us. We enjoyed a number of its features including that it covers up to two acres, making it just the right size for most households. The product kit also includes a remote with a beep, vibration, and shock mode, allowing you to alter as needed. The best feature of this product is truly wireless design which eliminates need to lay any wires. Plastic-like collar is less than appealing. Generally nylon collars are more comfortable and dog-friendly. While we loved a lot of the features of this one, we have a few reservations with it overall like it has no ability to set a perimeter, as it doesn’t include wiring. Absence of wiring make it completely ineffective if you’re not present. While two acres may be plenty for some, it doesn’t quite the large acreage challenge we were hoping for. Finally, it only covers dogs up to 100 pounds. In large acreage, you typically see larger dogs like mastiffs and guardian breeds wandering. They well exceed this weight limit. The Sit Boo-Boo Advanced Electric Hidden Dog Fence was another all-star in our book. We loved the range of this one and it had a number of highlights including a range of up to 20 acres, perfect for larger, rural properties and farms. It includes a variety of settings including shock, vibration, and sound. The best thing about this wireless dog fence is that it does not require your presence to be effective. There is a remote option as well if you wish to correct nuisance behaviors on the go. 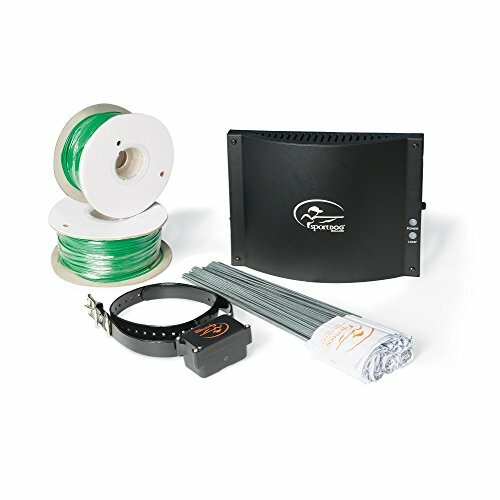 You can add an unlimited amount of collars to the system without issue, perfect for multi-dog homes spanning over several acres. Additional wire would be required to achieve the maximum 20 acre coverage. This wireless dog fence system charges quickly and has a decent battery life. Since the batteries are rechargeable, you don’t have to worry about buying new ones constantly. While we are loving this system from all angles, we did find a few areas for improvement including the fact that it requires wire to be laid in order be work. This can be a lengthy, tedious process. The Extreme Dog Fence is another great contender on the market. We love its range and found it a worthy system to note. We loved a number of things about it like the fact that its transmitter has an incredible range of up to 25 acres. It features a waterproof system that can be submerged. It won’t be damaged if you pup decides to take a swim in the pool or pond. Always a plus! 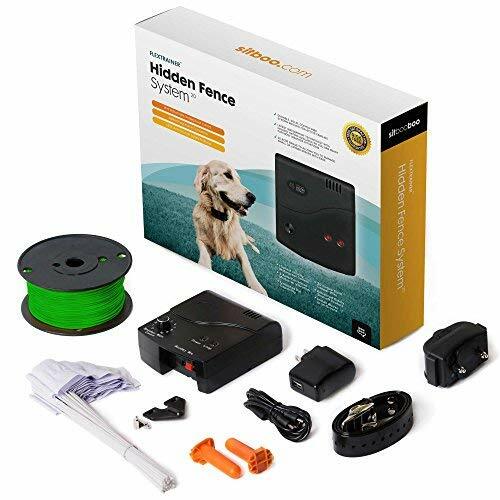 With this wireless dog fence system multiple dogs can be added to the system as needed which is beneficial in multi-dog households. It comes with lightweight comfortable collar that’s comfy even on the little pups. Also multiple levels of correction available, allowing you to adjust to your dog’s needs. Does require wire to be laid in order to be effective which can be time consuming and tedious. While we are loving a lot of things about this option, we do have a few sore spots including the fact that the initial pack only contains enough wire for a half acre. Additional wire would need to be purchased to cover your required space. This can get pricey! The SportDOG Brand In-Ground Fence is another notable option available on the market. We found quite a few high points with this system including an impressive possible range of up to 100 acres with additional wiring. It comes with waterproof collars that leave rainy day worries in the dust. With this dog fence system additional dogs can be added to the system, perfect for ever-expanding multi-dog households. The product kit contains flags for marking above ground and comes with straightforward instructions and installation. While we are impressed with a lot of what this system has to offer, we have a few reservations including that Wire does need to be placed in order for this system to work. This is time consuming, especially if you’re requiring a system to cover multiple acres. Furthermore, the collar didn’t seem all that comfortable. It was rather rigid and a bit bulky for our liking. This isn’t ideal for smaller dogs. 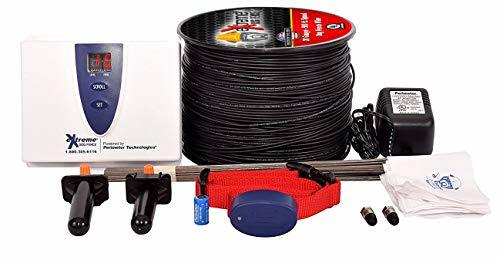 The Wireless Combo Electric Dog Fence System was another worthy contender we discovered, offering a number of great features like the initial kit covers up to 1 acre. The range of the wireless fence can be adjusted range by buying more wire to add. You also get to have multiple levels of correction to choose from and multiple levels of contact points for dogs with short and long hair. The product kit also includes a remote for correcting other behaviors on the go. It even includes flags for above ground use, aiding in training. Finally, an unlimited amount of dogs can be added to the fencing system. While we appreciate the overall quality of this system, we did find a few areas that were less than stellar like the collars were rigid and seemed uncomfortable. As previously stated, nylon generally is the most comfortable. We wished companies would stop using the stiff plastic. Finally, because of the material, these collars likely won’t last long with traditional wear and tear. Coming out with a winner wasn’t all that hard. The Sit Boo-Boo Advanced Electric Hidden Dog Fence was our favorite, given it’s incredible range. It keeps your dog safe without your undivided attention and is durably made to withstand the elements. The collar seemed more comfortable than other options out there. Multiple dogs can be added to the system and there is an option to purchase a remote for use correcting other nuisance behaviors. There were also a number of settings to choose from including shock, vibration, and sound, allowing users to set to their dog’s needs. This is critical, as dogs do not have a one-size-fits-all set of needs.